Jimmy Rogers at Tom George Yacht Group tells me he closed on the sale yesterday of the 28.6m motoryacht Khamsin, listed by Tony Lazzara at HMY Yacht Sales. 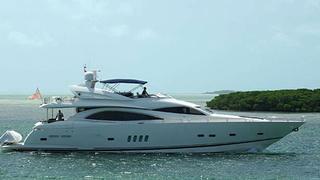 Sold to an Australian, Khamsin is a Sunseeker 94 delivered in 2005. A fine example of this series, she accommodates eight guests in a full beam master suite, VIP stateroom and two twin cabins while twin 1650hp Caterpillar engines give her a cruising speed of 20 knots. Khamsin was asking $2.6 million and will be renamed Blinder.